Starter: Watch the video beneath and take notes on the key aspects of freshwater supplies around the world. ﻿Task 1 - Watch the video to the right hand side and make notes on the two different types of water scarcity that exist and global regions affected. You may use the outline worksheet to help you. Highlight the key issues here and add them to your revision booklet. Higher Level Students at IST may have already got their definition down as this links in with the Freshwater unit of work. The world has met the target of halving the proportion of people without access to improved sources of water, five years ahead of schedule. Between 1990 and 2010, more than two billion people gained access to improved drinking water sources. The proportion of people using an improved water source rose from 76 per cent in 1990 to 89 per cent in 2010. 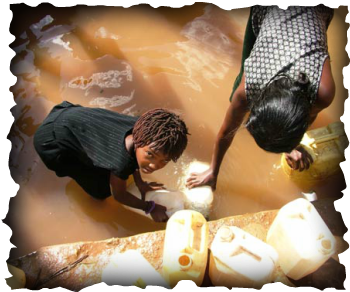 Over 40 per cent of all people without improved drinking water live in sub-Saharan Africa. In 2011, 768 million people remained without access to an improved source of drinking water. Over 240,000 people a day gained access to improved sanitation facilities from 1990 to 2011. Despite progress, 2.5 billion people in developing countries still lack access to improved sanitation facilities. Objective: To gain an appreciation for the importance of access to safe drinking water and look at some solutions to bring clean water to populations in need. Task 1. This resource from the Guardian. Read through the first section on sanitation and focus on the second section on improved access to fresh water. Task 2. On your own copy of a blank political world map, annotate the data for the IB 5 focus countries (+ France). Task 3. Then write a piece of commentary that compares global access to Freshwater with the global distribution of those countries that met Goal 7 in 2015. No go here and watch the four minute video on water contamination. Make further additions to your task 4 notes. Task 5 - Watch this TED talk on an innovation designed to clean up dirty water to improve access to clean drinking supplies. Evaluate the project clearly in terms of the likely outcomes.